Even if fishing is slow for other species, schools of voracious hard-fighting bonito like this one with Robinsion and Capt. 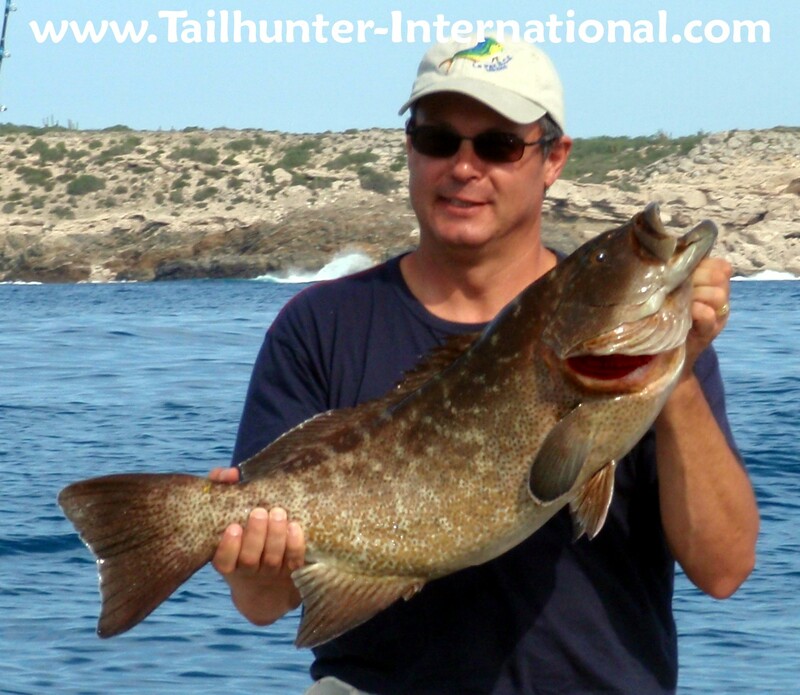 Jorge off Punta Perrico still provide fun light tackle action. 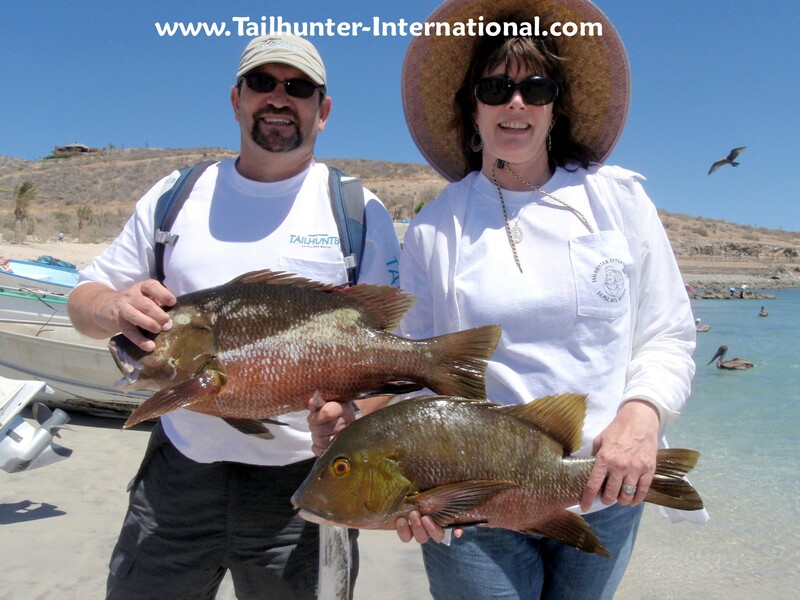 San Diegans Kim and Bob Perry hold up a couple of nice barred pargo on the beach a Muertos Bay. Well, to be perfectly honest, fishing wasn’t that remarkable this week. It was a little cold and windy some days which is typical. Fishing was so-so. We got some sierra, and some cabrilla and some yellowtail, a pargo or two and a couple of dorado. Everyone we sent out caught fish and had a nice time, but it was nothing to write home about. That’s the truth. One of those unusual weeks…really unusual! But we also tell people it can be like that this time of year. They understrand that. They enjoy time on the water and since many of them come from freezing places like Minnesota and Colorado and New York, they’re happy just to be fishing instead of digging out of snow. Fishing was not stellar…so what..it beats being in a blizzard. Fishing might have been less-than-spectacular. But, it’s also Baja and it can change just as quickly too! Wind predictions look better for this coming week so we plan to have better reports for you in the next weekly report. Every year at Cabin Fever Classic we get surprises like these unusual big bull dorado that Steve and Charlie got. We just wrapped up 4 days at the Washington Sportsmen’s Show at Puyallup, Washington near Seattle. 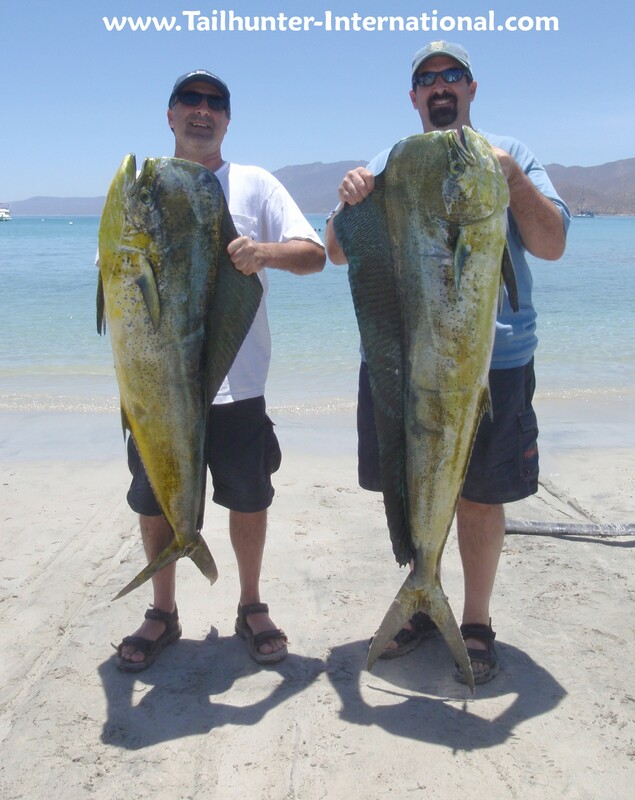 Great time and great to see so many of our amigos, many of whom booked their 2011 La Paz fishing trips. We’re pulling up stakes and driving east again to Salt Lake City to the massive Western Hunting Conversation Show at the famous Salt Palace. It promises to be a good one. Every day we’ll have our booth on the convention floor and in the evenings, there are big dinners, concerts and auctions including Saturday night with Ted Nugent himself. Come by! The show is Wednesday to Sunday! Dorado in January! It's not typical, but a nice suprise but we're getting a few every week. 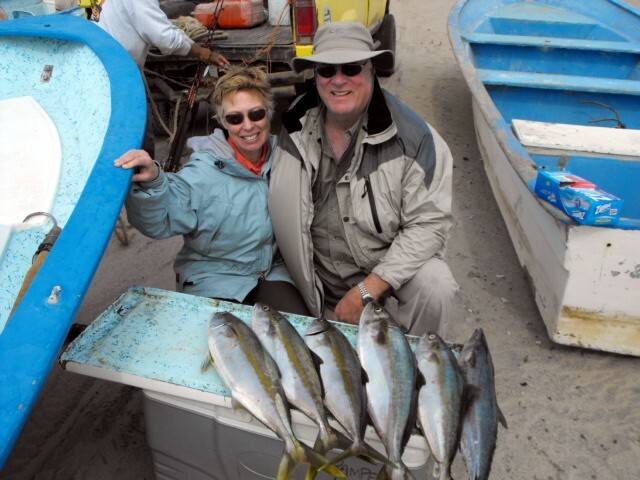 Arnie and Kathy Sandness were on their first trip to La Paz this past week from Arizona and took this nice pair fishing with our Las Arenas fleet just out've Muertos Bay. More typical of the fishing during the winter months are these cabrilla that are a great catch inshore right now. Most fish are about 3-5 pounds and can be found pretty much anywhere there's some rocky structure and have a habit of hitting hard and dashing back into their holes! 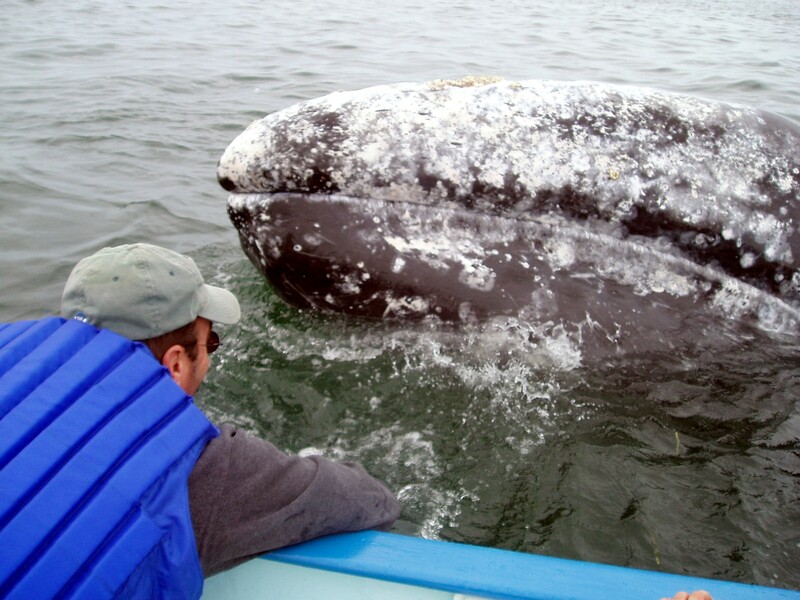 Gray whales have started moving into their yearly winter residence at Bahia Magdalena. For a great day trip, ask us about setting up a trip for you and your family. It was great to see so many amigos at the California State Fairgrounds this past week at the International Sportsmen's Expo. It was a spectacular show and it was great to see so many of you and have you book your 2011 trips to La Paz. We now take the 2011 road tour to the Washington State Fairgrounds at Puyallup, Washington near Seattle. We'll be there Wednesday to Sunday. Come check us out! DORADO AGAIN SPARK A MIXED BITE BUT YELLOWTAIL SHOWING SIGNS! About half the week it was pretty windy making it, not impossible, but certainly uncomfortable or difficult to fish. Other days, it was actually rather nice. We got a weird strange mix of species which kept it interesting. A few small firecracker dorado mixed it up with sierra, bonito, some cabrilla and pargo made for quite a buffet of species. Besides the wind, there was some red-tide that came into La Paz Bay that made me glad that we kept most of our fishing out’ve Las Arenas instead of La Paz. However, we’re getting some really encouraging signs of yellowtail schools north of La Paz near and around Espiritu Santo Island. We’re gonna send out s few exploratory trips because private boats and commercial pangeros are seeing some nice jags of breaking fish here and there right on the surface with some reports of larger 20-30 pound fish rolling and foaming in the upper water column on schools of bait. We’ll keep you posted! After 3 weeks that have taken us through 8 chilly states and 3 shows including Denver, Colorado; Billings, Montana and most recently Sacramento, CA, we now take the road to Puyalup, Washington at the state fairgrounds near Seattle. We’ve had a great time seeing so many amigos. 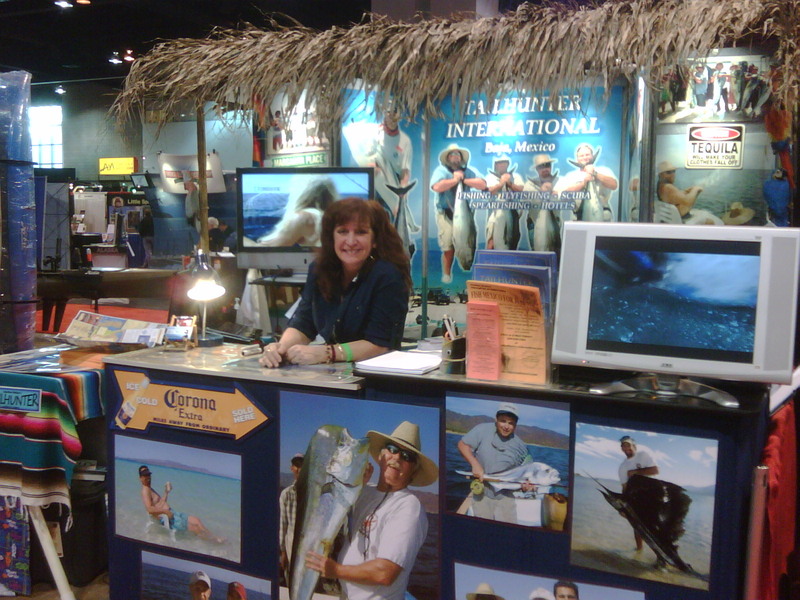 We’ll have our booth there along with all our brochures and new DVD plus all the details you’ll need to set up your 2011 fishing trip to La Paz. We’ll be there from January 26-30 (Wednesday to Sunday). Hope to see you! We’ve still got some spots left for our 2011 Cabin Fever Classic Event for the 8th year. The dates are April 9-13. 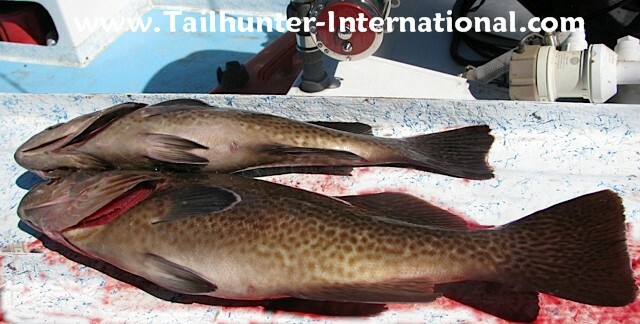 For more details, e-mail us at riplipboy@tailhunter-international.com It’s always a fun event and space is limited! Have a great week. That’s our story! Nice cabrilla like this one Dave's holding just off Punta Perrico are prime time right now and great eating. Schools of jack crevalle have started moving into the shallow beach areas of Las Arenas. 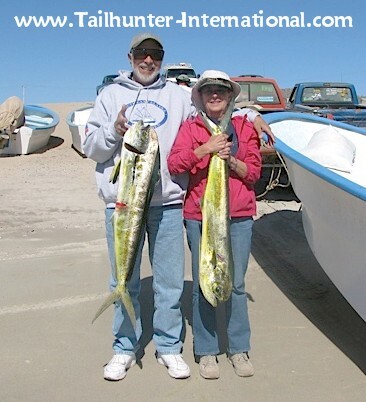 DORADO SHOW UP AGAIN TO EVERYONE’S SURPRISE BUT INSHORE SPECIES STILL MAIN EVENT! It was a cool and windy week, but the fish we caught indicate that we still have some warm waters around. In addition to pargo, sierra and cabrilla…normally cool water fish, we also got into a few little jags of dorado. Nothing large with fish in the 8-15 pound class but fun fish and a nice surprise just-the-same. All our fishing is mostly out of Muertos Bay near Las Arenas using live sardines. 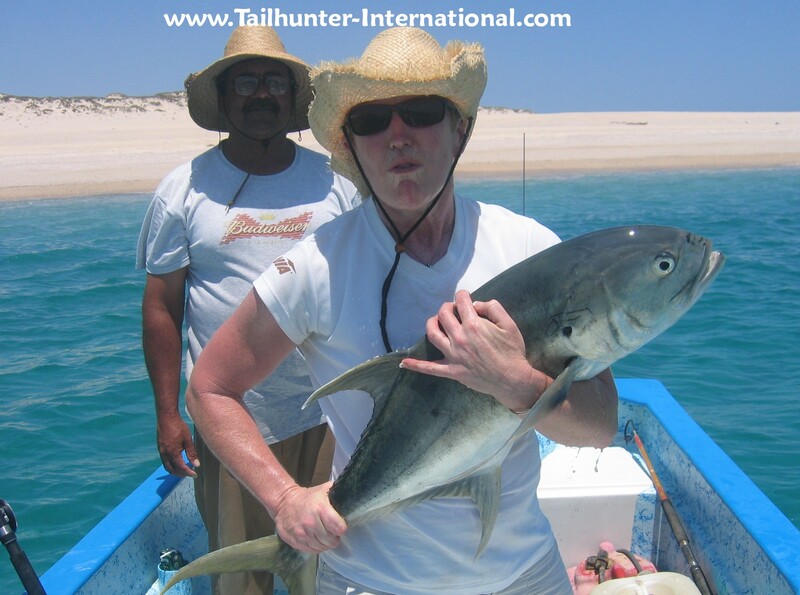 We had some really nice big schools of jack crevalle move up into the sandy beaches near Las Arenas a few days. These schools can be anywhere from a dozen to several hundred fish and they are great to get into whether 10 pounders or 30 pounders, these fish can really tear it up. There’s a reason the Mexican name for them is “toro” (Bull). They’ll eat live bait, lures, surface poppers…they’re not picky. Fantastic on light tackle or on the flyrod. Unfortunately, they’re not really good to eat unlike their cousins, the yellowtail and amberjack and pompano, but they all have that slugger attitude when hooked. Hopefully, with the showing of the jack crevalle, we’ll start seeing more roosterfish as well. 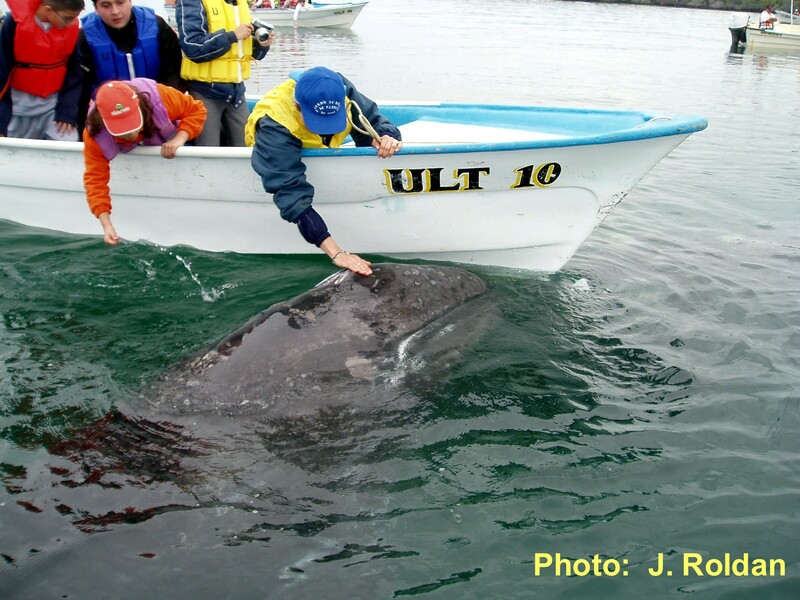 We start running whale watching trips from La Paz beginning this week over to Lopez Mateos in Magdalena Bay. From January to March, the grey whales by the hundreds take up residence in the warm, shallow waters of the bay to mate and give birth. Really a great life experience for the whole family. Ask us about setting it up for you. This includes our big welcome dinner; a taco night at the Tailhunter Restaurant and Bar; your airport shuttles from La Paz Airport (vans loaded with beer and sodas! ); your tackle, ice, fish cleaning, fish freezing, breakfast, lunch, soft drinks and water, shuttles to the boats and all taxes. Space is limited. Many couples join us and many of our regulars book a year-in-advance. So let us know ASAP. Deposits are only $200 with the balance due 45 days out. Hope you can join us! We are definitely into sierra season with quite a few of these speedy sportfish around now which is great for inshore light tackle. Captain Ramiro holds up a nice one. A fairly typical catch with our Las Arenas/ Muertos Bay anglers...decent size yellowtail and sierra...all close to shore. Grey Whale Season is here...from January to March, the grey whales take up residence in the shallow warm waters around Bahia Magdalena. For a great family experience of a lifetime where you get up close with these great animals in the calm waters of Mag Bay. 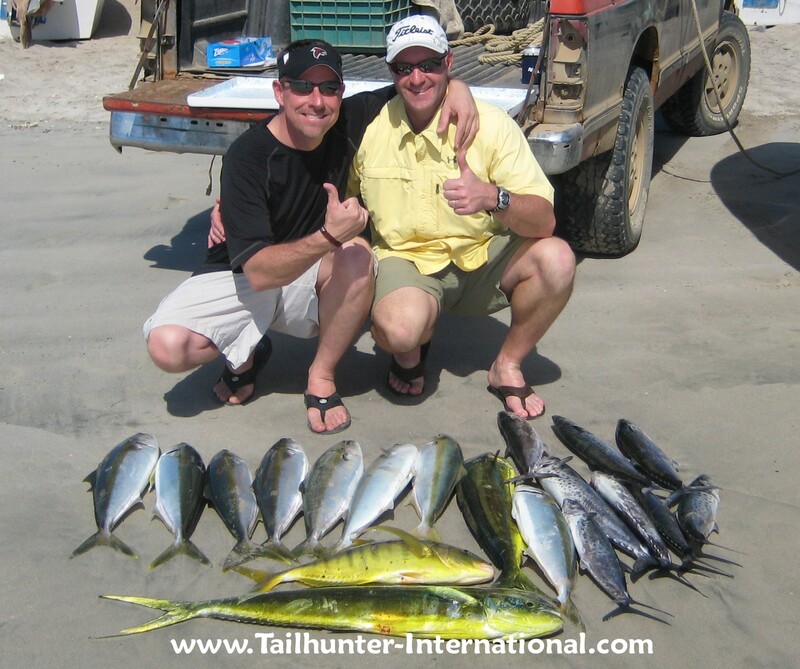 let Tailhunters set up your trip! 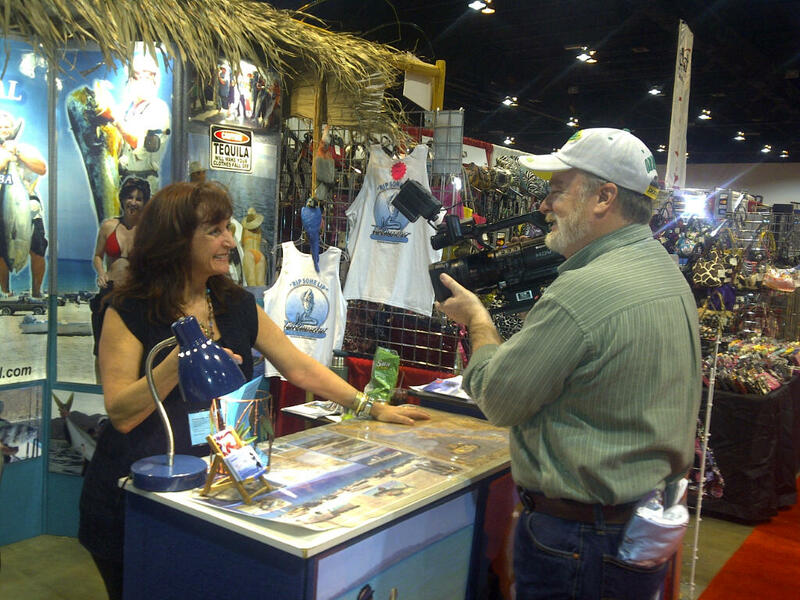 We've had a great time in Denver this past week at the International Sportsman's Expo. Great to have seen so many of our amigos. 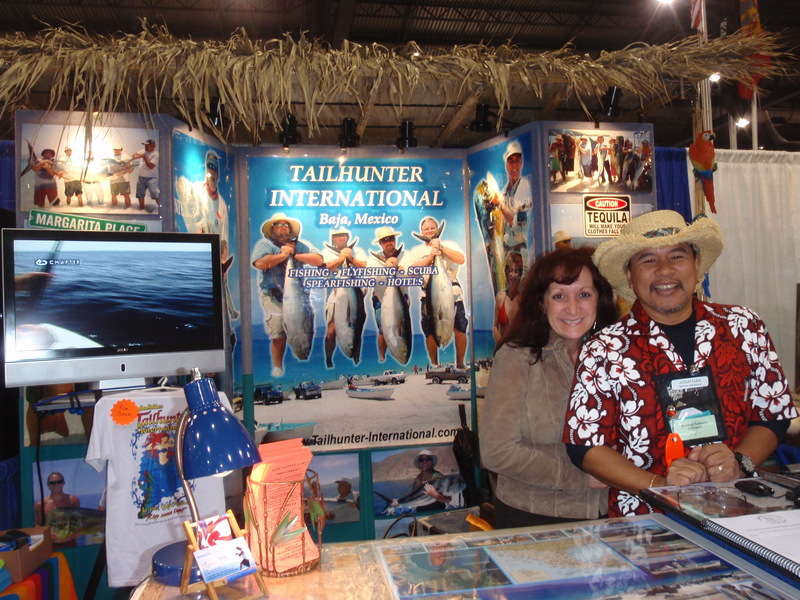 The Tailhunter International Road Tour 2011 heads to chilly Billings, Montana this week for the Great Rockies Sportshow. 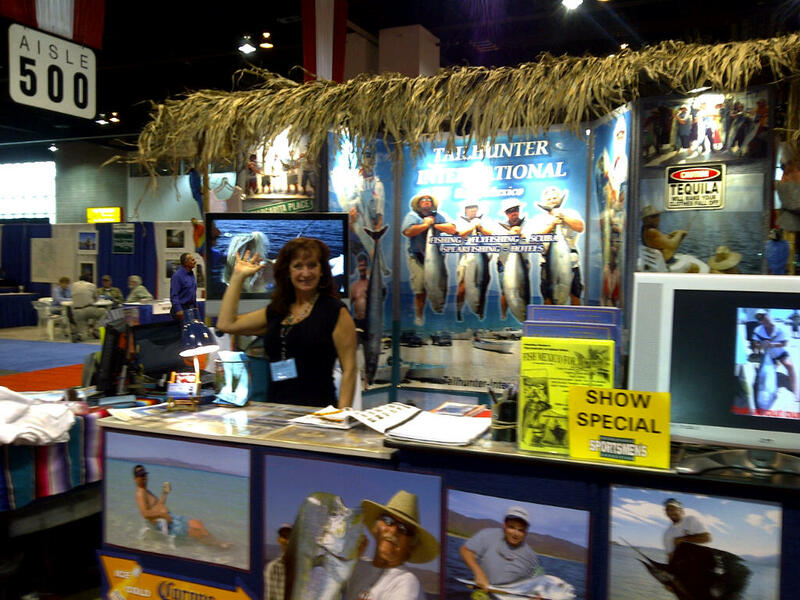 If you're in the area, come by the booth and book your 2011 trip fishing trip to La Paz. Some cloudy skies and wind this week in between some really nice fishing weather. Nice time to be in town. I think most of our anglers this week have been surprised at the variety of fish. Most of our fishing has been in the Muertos Bay area where even if the winds are a little blustery from the north, we can still be fairly protected since the fish are close and we’re on the lee side of the island. Species this week included pargo and sierra as well as cabrilla, but also a nice jag or two of yellowtail. Not big fish, but the yellowtail are certainly getting a little bigger than in the last few weeks and fun on light tackle or using the iron. The yellowtail were about 10 pounds before, but this week some skinnier 10-15 pounders were making themselves known. The other species readily ate live and chunked dead sardines. “Chunking” involves tossing handfuls of mashed and whole dead sardines into the current and letting it drift down. Anglers then pin another dead sardine to a hook and strip off handfuls of slack line which also drifts down with the rest of the “chunk.” It’s an effective way of getting stubborn fish like pargo, snapper, and cabrilla out’ve their rocky hideouts. Of course, once they bite, you have to turn them quick to kee’p them from heading back into the hole and cutting you off. By the way, we’re also sending out whale watching trips now to Magdalena Bay as the grey whales have started taking up their winter residences in the shallow lagoons. Usually, the whales are around from January to March with February being optimal for viewing with the whales and their calves often coming right up to the boats. If you’re going to be in the area of Billings, Montana, the Tailhunter International 2011 Road Tour will be moving from Denver to Billings this week. Come by and pick up our new brochures and DVD’s and book your next La Paz fishing trip. After that in two weeks, we head to the International Sportsman’s Expo in Sacramento CA at the State Fairgrounds. As Darrell George and Matt Collins from Colorado said, "It was pretty good fishing for December!" 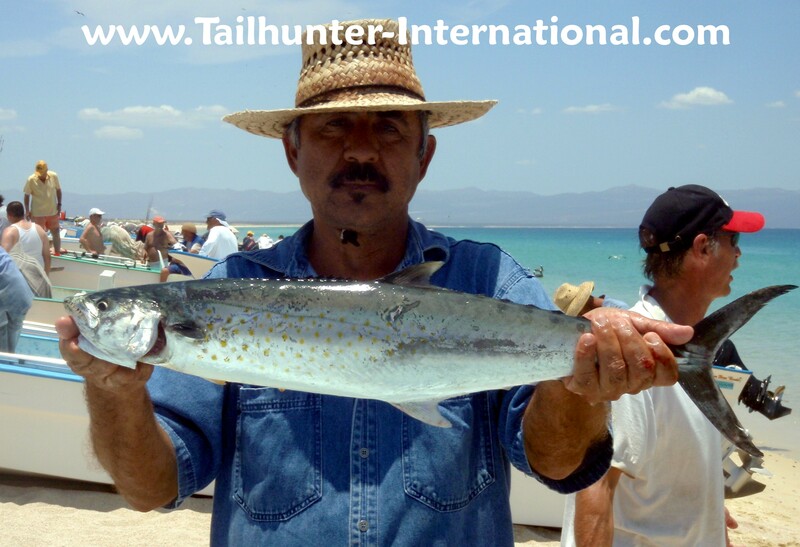 Actually, pretty good fishing any time of the year, but this shows the mix that was possible this last week with smaller yellowtail, dorado, pargo and sierra on the beach at Muertos Bay fishing with Captain Victor. The 2011 Tailhunter Road Show has started! We'll be in our booth from Wednesday to Sunday this week at the downtown Denver Convention Center for the International Sportsmen's Expo. 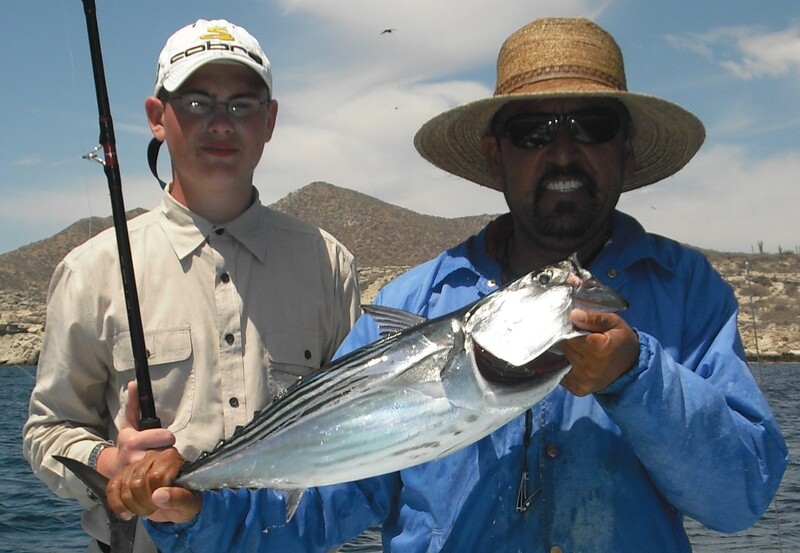 Come say hi and book your 2011 La Paz fishing trip! GREAT MIX OF SPECIES TO END ONE YEAR AND START THE NEW ONE! It’s been a real “chop suey” week of fishing here! It’s like everything was all mixed up with both warm and cold water fish all in the same spots! Literally, we must’ve had about 10 different species biting and some anglers got almost all 10 species fishing the same spot on the same day. Small yellowtail have now moved in that are in the 10 pound class but we also got some amberjack up to 30 pounds as well as jack crevalle, pargo, snapper, cabrilla, bonito, and sierra. But those same boats are still getting a smattering of dorado also…clearly a warm-water fish! It just makes for some fun fishing when you get this kind of variety and all the fish are close to shore too eating live bait. We’re on the road finally and will be in Denver starting Wednesday to Sunday at the International Sportsmens Expo at the downtown Denver Convention Center. It’s always a great show and we’re looking forward to seeing all our amigos! Our booth will be in the same location as always. It’s freezing. As I’m writing this, it’s 2 degrees above zero. Definitely NOT La Paz weather and our van already broke down once in the snow! But it’s always a great trip into the Rockies and we look forward to the tour every year. This is the start of our road tour for the year. Over the next 11 weeks we’ll be in 11 states doing all the major fishing/hunting shows so we’ll see you down the road. Next week, we’ll be in Billings, Montana. Then Sacramento CA. That’s our story! Happy New Year everyone!